Covering more than 50,000 square kilometers, the Great Hungarian Plain accounts for more than half of Hungary’s total area. Additionally, it is the largest part of the Pannonian Plain, which also covers parts of Serbia, Croatia, Slovakia, Ukraine, and Romania. As the name suggests, the Great Hungarian Plain is very flat, with a peak of only 180 meters. The region consists of national parks, and vast grasslands, which are home to cattle, sheep, and horses. If you’re interested in Hungary’s history, head to Hortobágy National Park, which is close to the city of Debrecen. The park, also called Puszta, is Hungary’s largest national park, and part of the Pannonian steppe. This is an off-shoot of the Eurasian Steppe, which stretches all the way to Mongolia, and is the largest, and best-known steppe (a large, unforested area of grassland) in Central Europe. 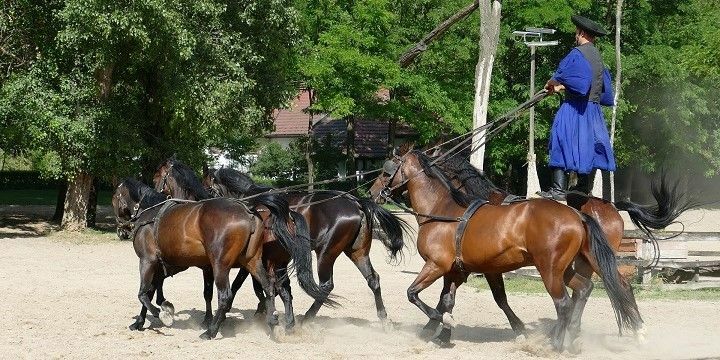 Traditional Horsemanship plays an important role in the Great Hungarian Plain region. Hortobágy National Park is one of the few areas in the region that is still a steppe in the traditional sense, as most others have been used for agricultural purposes. Founded in 1973, and declared a UNESCO world heritage site in 1999, the park is home to some of the Puszta’s most unique wildlife. You’ll find over 300 species of birds in the park, where you can also experience the traditional lifestyle of the Csikós (horsemen). These nomads have been living in the region for several decades and are happy to demonstrate their impressive horsemanship to visitors. If NextStop24 helped you to choose your next travel destination, we'd be very grateful if you’d search for your accommodation and things to do in the Great Hungarian Plain through these links. They're affiliate links, which means that we will receive a small commission for every booking made through them. There are no extra costs for you; you'll simply be helping to keep NextStop24 running. Thanks!